Our innovative range of FastPitch™ Tents is ready for adventure when you are. Whether you’re heading for a weekend away or attending a festival, these feature packed and resilient tents are easy to set up and take down, leaving you with more time to start making memories. The FastPitch™ Air - Valdes can easily be inflated, pitched and dismantled in minutes thanks to a revolutionary new Coleman® technology. Step 1: Push in the pin and release. The pin must be in extended position for inflation. Step 2: Inflate pole to 7PSI – pump and manometer included. Step 3: Replace the cap. Step 2: Push in the pin and release to open the valve. The pin should be retracted for deflation. Kick off your adventure in style with the innovative FastPitch™ Hub. The FastPitch™ Hub system utilises three key elements to ensure the tent is even simpler to pitch by one person; a central hub has the fibreglass poles permanently attached, so no confusion over what goes where, the inner tent is also attached to the hub, removing any fiddling with knots and colour coded Fast Fit Feet ensure all poles are securely in the correct place - first time. 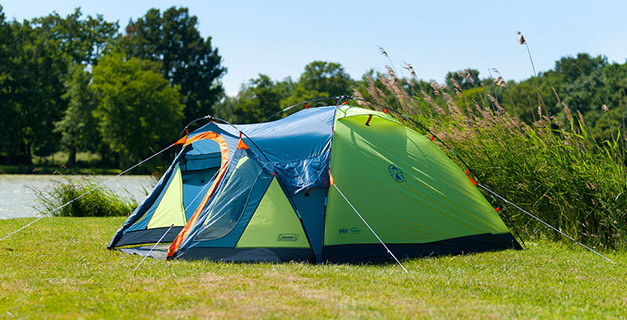 Be the envy of friends and family with the ultra-convenient FastPitch™ Pop Up tent. Ideal for festivals and weekend getaways, this lightweight tent is up in an instant and packs away compactly for easy transportation and storage.